Here’s a post that has nothing to do with fitness! (Do I hear shouts of “Hurray!”? LOL!) Over the years, my husband and I have had fun creating unique costumes that we’ve made on our own. I do not consider myself crafty so if I can do this, so can you! 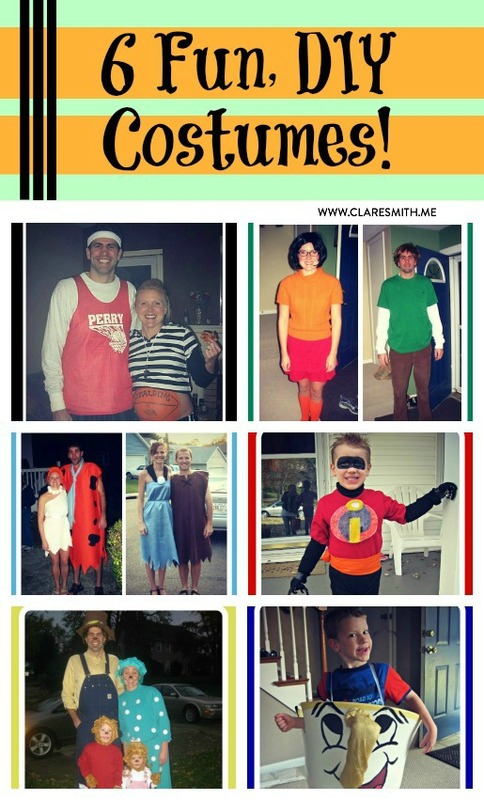 So whether you need a costume for Halloween, a Harvest party, or just fun, maybe you can find some inspiriation below! 3.) Basketball, ref and basketball player! So the next year, I was pregnant with my first child. My husband took halloween paint and painted my belly. (Yes, that’s my bare belly. Sorry if this freaks you out) And then he went as a basketball player! My son got into the Incredibles when he was 4, so this was a perfect option for him. – I used 2 pair of black adult socks. One pair as his arm sleeves (Cut off the ends and wore gloves) and the other pair that went over top of his shoes that made them look like boots. I put some duct tape on the bottom to rough it up a bit because a sock on the ground was a little slippery! 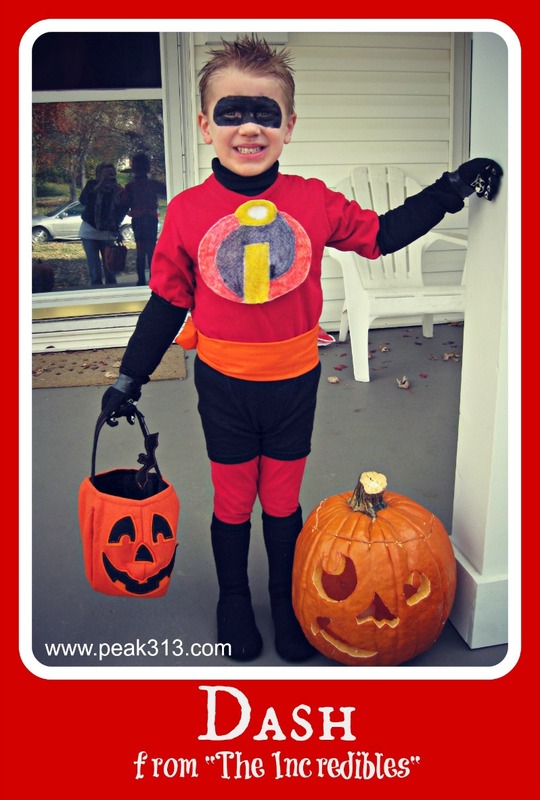 – We enlarged and printed off “The Incredibles” logo from the internet and then traced and colored them on felt. – We used a larger pair of boys boxer brief underwear for his shorts so that they stayed closer to his body. This was our costume last year and probably my favorite option because it involved our whole family. There’s a little backstory to this too. Besides the fact that we love them, we kind of mimic them. We’ve always called our kids Brother Bear and Sister Bear and have referred to my husband and I as mama and daddy bear. It was fun to walk around like this. My husband was a good sport! I got all of the clothing (except hubby’s overalls) at Goodwill! – My hat was a shower cap wrapped with fabric. I stuffed paper towels in between those layers to make it puff up more, then cut and glued circles on it. This was actually for my daughter’s 3rd birthday. My son mentioned he wanted to be Chip, so my mom whipped this up! I hope you enjoy these! We certainly have had our fun with them over the past 7 years! I love these – you are so talented! 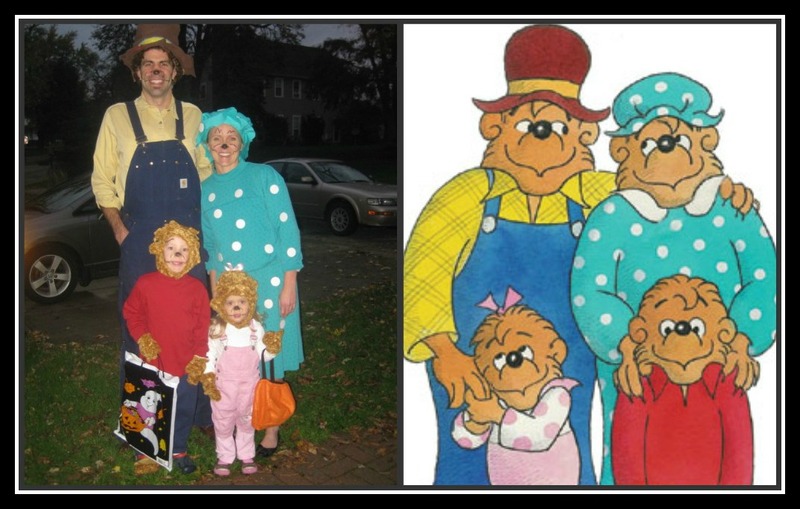 Would you consider selling or renting your berenstain bear costumes? It would be for this weekend though 🙁 I chose this theme because I wanted to celebrate family . I lost my baby daughter last year and I have a son turning 4. I would love to use your costumes if you still have them? How fun! 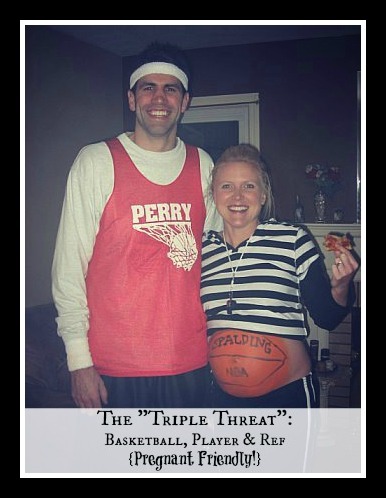 I especially loved your pregnant belly as a basketball and the Berenstein Bears. 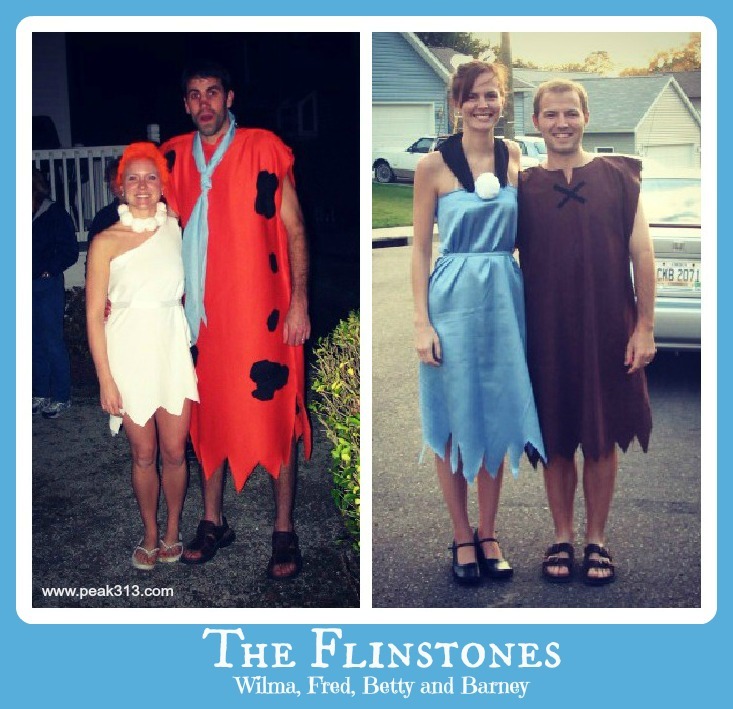 Thanks for posting the pictures — very fun costumes! My daughter (14) wants to be Wilma this year. Any tips on how you made the costume? (I don’t have a sewing machine) Thanks! I think we took one really long piece of fabric, cut a hole out for the head, then started with scissors and cut the one arm out and then cut the jagged bottom. We may have hot glued the top together but I can’t remember. Then just tied a ribbon around the middle! For the necklace, we just took a ribbon and hot glued large cotton balls to them! I have the Mama Bear costume all set. Wondering where you got your kid’s wigs and ‘paws’. I’m also having trouble finding men’s overalls. I don’t want to spend $40 for a pair. Hi there! I was lucky to find the hat and gloves at a store locally and just modified them from there. They were a teddy bear winter kit and I cut up and sewed ears on them. I don’t know what you could do if you don’t have a hat/glove set. That was my biggest challenge! The men’s overalls my husband had because his dad was a telephone man for 30 years and it’s what they wore! He’s had them for years and shovels snow in them so we lucked out there too! 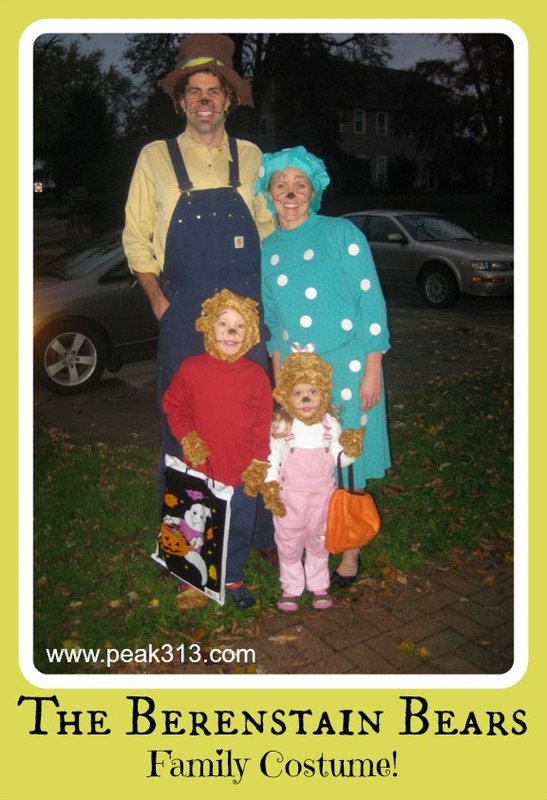 I, too, would love to know how you made the kids paws and head dress for the berenatain bears costume!!! Super cute costumes!! Love the Bernstein Bear costumes. Where did you find the bear headpieces? Oops! Lol. Somehow missed that comment..never mind! 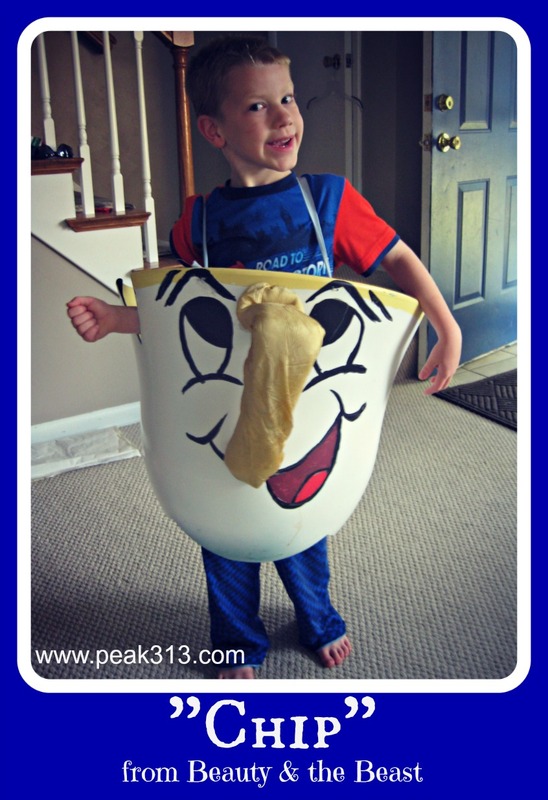 Awesome – thanks for sharing these great DIY costume ideas. I thought you and your readers might be interested in the creative costume contest over at http://www.halloweenhero.com/costume-contest-2013.html – the best part is the $250 grand prize. Homemade costumes are THE BEST! Last year my husband’s office had a costume contest and he went as Wolverine and literally cut claws out of cardboard that he covered in aluminum foil…he wore a leather jacket and ripped jeans he had, and spiked up his hair. He ended up winning a Macbook! 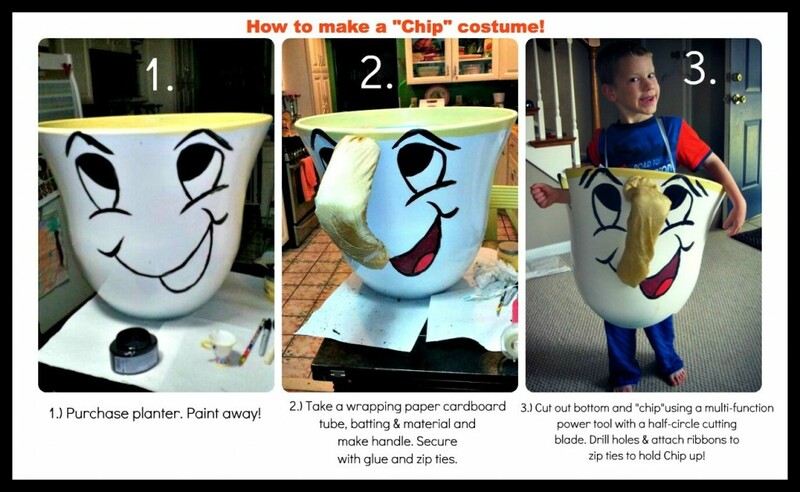 For the chip costume, where did you find the planter and how did you insert the wrapping paper tube to planter. 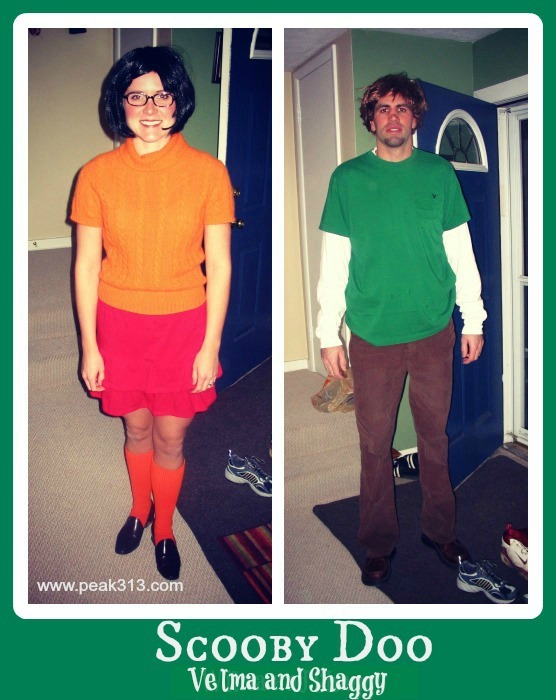 I really want to do this for Halloween 2017!!! !